Biopharmaceuticals are drugs that are partially or fully manufactured, or extracted from biological sources. Biopharmaceuticals contain variety of products such as monoclonal antibodies, vaccines, recombinant human insulin, human growth hormone, erythropoietin, interferon, colony stimulating factor, and blood factors. Currently, biopharmaceuticals accounts for over one-fifth of pharmaceutical market, and this percentage share of biopharmaceutical is expected to increase, owing to its advantage compared to totally synthesize pharmaceutical drugs. Fewer side effects, high effectiveness and potent action, and ability to cure the disease rather than treat are some of the major advantages of these drugs. In the recent past, regulatory bodies in key regions such as U.S. and Europe have approved a number of biopharmaceutical products, which have been subsequently launched in the market. For instance in 2017, Johnson & Johnson received U.S. FDA approval for its new immunology product—Tremfya (Guselkumab)—used for the treatment of moderate to severe plaque psoriasis. In 2017, Sanofi S.A. received U.S. FDA approval for its new Admelog, a rapid-acting insulin, indicated for the management of blood sugar levels at mealtime. In 2017, U.S. FDA approved GlaxoSmithKline Plc.’s New Shingrix, a shingles vaccine. FDA approved this vaccine to be used by people aged 50 years and above as an immunization against the painful condition caused by latent varicella infection. In 2017, Spark Therapeutics, Inc. received FDA approval for its LUXTURNA (voretigene neparvovec-rzyl). LUXTURNA is first gene therapy and pharmacologic treatment for an inherited retinal disease (IRD), and the first approved adeno-associated virus (AAV) vector gene therapy in the U.S. In 2017, HumanZyme Inc. launched its new HumanKine Interferon beta (IFN beta) expressed from HEK293 cells. IFN beta is an interferon of type I family, which activates Th1-type innate immune responses against viral and bacterial infection. In 2016, Novo Nordisk A/S launched its new next-generation once-daily basal insulin Tresiba (insulin degludec) in the U.S. market and in 2017, Nordisk A/S received China Food and Drug Administration (CFDA) approval to market its Tresiba (insulin degludec) in China. Such frequent launches and approvals of novel products is expected to drive growth of the market in the near future. The global biopharmaceutical and biomedicine market was valued at US$ 358.4 Bn in 2016 and is expected to witness a CAGR of 9.4% over the forecast period (2017–2025). Players in the market are focusing on strategic collaborations, in order to increase their product offerings. In February 2018, LGC Limited— U.K.-based Company acquired Lucigen Corporation, a U.S.-based developer, and manufacturer of molecular biology enzymes, reagents and kits. Through this strategic acquisition, LGC Limited expanded its portfolio with the Lucigen’s extensive portfolio of NGS kits, enzymes, competent cells, and cloning systems. In February 2018, Servier Laboratories and ImmunoQure AG entered into a strategic collaboration for development of a therapeutic autoantibody neutralizing interferon- a. In March 2018, Wuxi Biologics Co. Ltd. collaborated with Adagene Inc., for the discovery and development of novel antibody therapeutics. In 2017, Omicia, Inc., acquired a bioinformatics startup Spiral Genetics at an undisclosed amount. Through this acquisition of Spiral’s advanced tools, Omicia, Inc., expanded its bioinformatics tools portfolio and strengthened its position in the global market. Moreover, increasing funding and investments to support the development and research of new biopharmaceutical is also expected to drive the market growth. For instance in 2017, Indian government launched a National Biopharmaceutical Mission. As per the program, the government has invested US $250 Mn that includes a US$ 125 Mn loan from the World Bank to promote development of biological drugs in India. In 2017, The University of Liverpool and the Johns Hopkins University School of Medicine (JHUSM) collaborated for the development of new nanomedicine approaches for HIV therapy, and received an award of US$ 3 million from National Institutes of Health (NIH) to generate new technologies and continue research and development. Cost of biopharmaceutical and biomedicine products are quite high as these need research and development process, and its manufacturing is very complex process, which needs highly skilled scientists. Such expensive biopharmaceutical products are not affordable to organizations in emerging economies such as India, China, and Africa. High cost of biopharmaceutical and biomedicine is a major factor hindering its adoption. For instance, in India a vial of Avastin, a monoclonal antibody, costs between US$ 372.65 to US$ 402.46. High cost medicine is not affordable to everyone, hence, it is a major restraining factor for the market growth. Cost of gene therapy such as Kymriah is very high. Kymriah is a CD19-directed genetically modified autologous T cell immunotherapy indicated for the treatment of patients up to 25 years of age with B-cell precursor acute lymphoblastic leukemia. The cost of Novartis AG’s cancer therapy Kymriah is about US$ 475,000. 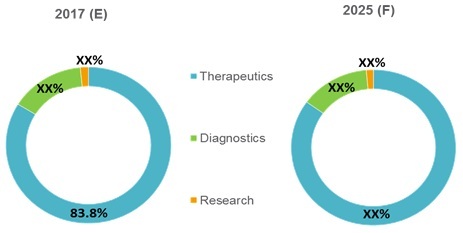 Key players operating in the global biopharmaceutical and biomedicine market include Amgen Inc., F. Hoffmann-La Roche AG, Novartis AG, Johnson & Johnson, Pfizer, Inc., Sanofi S.A., Eli Lilly and Company, AbbVie Inc., Novo Nordisk A/S, Bristol - Myers Squibb, NanoString Technologies, Inc., Qiagen N.V., Celgene Corporation, and Affimed N.V.
Biopharmaceuticals has emerged as one of the key segments with immense growth potential in the healthcare sector. Rising demand for effective treatment and rise in per capita healthcare expenditure has led to double digit revenue growth for industry players in the recent past. The industry offers lucrative growth opportunities, since most of these products still have low penetration rate. The market is expected to gain further traction, with evolving treatment archetypes and rapid technological innovation such as cell therapy and regenerative medicines. Launches and approvals of novel biopharmaceutical and biomedicine products is expected to drastically drive growth of global biopharmaceutical and biomedicine market in the near future. For instance, in 2016, Sanofi S.A. received U.S. FDA approval for its Adlyxin ((lixisenatide) injection. Adlyxin is indicated to improve blood sugar levels among adults suffering from type 2 diabetes. In 2016, Johnson & Johnson received U.S. FDA approval for its Stelara (Ustekinumab), indicated for the treatment of adults suffering from moderately to severely active crohn’s disease. In 2016, CSL Behring received U.S. FDA approval for its IDELVION, Coagulation Factor IX (Recombinant), Albumin Fusion Protein. IDELVION is indicated for the treatment of Hemophilia B among children and adults. In 2017, Nanostring Technologies, Inc. launched nCounter platform advances as well as new panels expanding the company’s presence in immuno-oncology and 3D biology research. In 2015, Celltrion Healthcare Co., Ltd. launched its Remsima (infliximab), a biosimilar monoclonal antibody (mAb) in Austria, Belgium, Denmark, France, Germany, Greece, Italy, Luxembourg, the Netherlands, Spain, Sweden, and the UK. Furthermore, increasing collaborations and acquisitions by major key players in market is also expected to create lucrative environment for growth of market. For instance, in 2016, Biocon Ltd., wholly owned subsidiary of Biocon SA, collaborated with Laboratorios PiSA S.A. de C.V—a Mexico-based company—for the co-development and commercialization of generic recombinant human insulin (rh-insulin) in the U.S. market. In 2016, AbbVie Inc. acquired all rights from Boehringer Ingelheim (BI) for Risankizumab (BI 655066). Risankizumab is an anti-IL-23 monoclonal biologic antibody for psoriasis. Company is also evaluating the product for other indications such as Crohn’s disease, asthma, and psoriatic arthritis. Currently, it is in clinical phase 3. Key companies covered as a part of this study include Amgen Inc., F. Hoffmann-La Roche AG, Novartis AG, Johnson & Johnson, Pfizer, Inc., Sanofi S.A., Eli Lilly and Company, AbbVie Inc., Novo Nordisk A/S, Bristol - Myers Squibb, NanoString Technologies, Inc., Qiagen N.V., Celgene Corporation, and Affimed N.V.
*Browse 45 market data tables and 42 figures on “Biopharmaceutical and Biomedicine Market - Global forecast to 2025”.